Learn some secret shortcuts for power users. Kashoo has some tips and tricks that are not completely obvious, but might save a bit of time or give you access to functionality you couldn’t access any other way. The date fields (the ones with the little calendar) support a variety of date formats beyond the usual YYYY-MM-DD or DD/MM/YYYY. For a full walk through of the scenarios discussed above, please read the article Using Taxes When Entering Income and Expenses. A combo box is a text entry field that has a pop-up list you can choose options from. It is a combination of a text field and a list. Our combo boxes have a search function built-in. By typing part of the name/number of an account, item, country, province, customer, vendor, or payment term, it will reduce the number of items in the pop-up list to only those matching what you typed. Once you have reduced the number of choices down to just one or two, use the up and down arrow keys to select the one you are looking for and press the Enter or TAB key to select it. One benefit of the search feature is that once you start searching it may reveal accounts that were not shown in the list because they were the wrong type. Otherwise you would have to click Show All Accounts... and then click the account you want. For example if you are buying office furniture you have to choose a Fixed Asset type of account, which isn’t shown by default in the Expense Account combo box. By typing “furn” you will see the office furniture account in the list and you can select it. If you type the exact name or number of one of the options for that combo box, it is automatically selected and highlighted; if you see the account number of an account you want to use (or you happen to have memorized it, as many bookkeepers do) you can just type that in and press Enter or Tab to move to the next field, which be a great time saver compared to using the mouse. Switching between the mouse and keyboard can be time-consuming for the power user in a hurry – here are some keyboard shortcuts available in the application on some browsers. 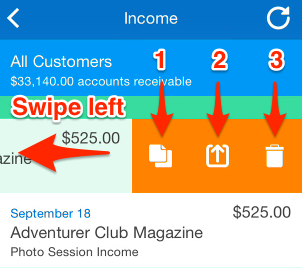 Additionally, if you swipe down, you can sync your transactions between the iOS app and the web app.